First off, HAPPY BIRTHDAY TO POLISHGALORE! I turn 2 today - woo hoo! Next, let me talk about today's makeup post - Obsessive Compulsive Cosmetics OCC Lip Tar in NSFW. While sitting in the Tampa Airport on Cyber Monday, with just a few hours left in this glorious shopping day, I decided to jump on OCC's website and check out these lip tars. I first saw them on Temptalia's blog and couldn't get this image out of my head. With all cosmetics being 20% off for Cyber Monday, I figured it was time to take the plunge. I even splurged and got the #009 Angle Brush "for complete, opaque coverage" (normally $18.00) . The whole thing about Lip Tars that I had read was "a little goes a long way." 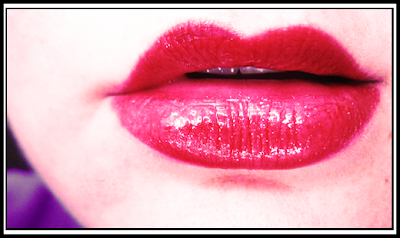 Lip Tar is normally $13.00 for a 0.27 Fl oz tube. Well, it came in today and I've been super excited to play with it. Now this being my second attempt at lip shots, please bare with me. First we have my bare lips. Then with NSFW applied with the #009 Angle Brush. I used one bead of color, no primer. The lighting is natural 6500K light bulbs (x3). Now I feel like I did it wrong. Granted the color was there but the creaminess I was expecting? Totally not. In fact, this was a very matte appearing application and definitely not as eye popping as Temptalia. In my slight defeat, I added a coat of Rimmel Sweet Jelly in #150 Sugar! on top. It's a gold shimmer that comes in 0.34 fl oz for $2.00. I wasn't in love - at least not yet. I'm going to have to try again and hope for the best. I also decided to play in Photoshop a bit... please note these were just meant to be funny. Heavy on the blur, please. Obsessive Compulsive Cosmetics products are 100% vegan and cruelty-free and may be purchased on their website. You can like them on Facebook & follow them on Twitter. Happy blog birthday ~ and I love Rimmel sweet jellies!